96-Well Cellular Senescence Activity Assay | Cell Biolabs, Inc.
Our Cellular Senescence Activity Assay provides an efficient method to measure Senescence Associated (SA) ß-galactosidase activity. SA-ß-Gal catalyzes the hydrolysis of X-gal, which produces a blue color in senescent cells. Quantify senescence using a fluorescence plate reader. 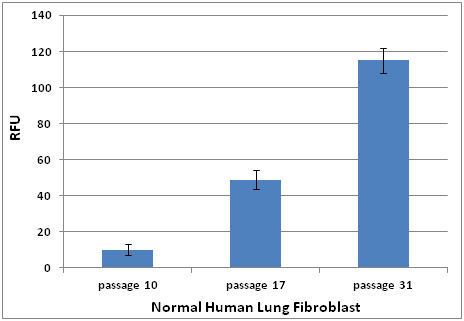 Figure 1: SA-ß-Gal activity in Senescent Human Lung Fibroblast HFL-1 Cells. Normal HFL-1 cells with different passage numbers were lysed. Lysates were allowed to incubate with SA-ß-Gal Substrate for 1 hr at 37ºC. Platas, J. et al. (2016). Anti-senescence and anti-inflammatory effects of the C-terminal moiety of PTHrP peptides in OA osteoblasts. J Gerontol A Biol Sci Med Sci. doi:10.1093/gerona/glw100. Sato, K. et al. (2016). Exosomes in liver pathology. J Hepatol. doi:10.1016/j.jhep.2016.03.004. Kim, D. S. et al. (2016). Cell culture density affects the proliferation activity of human adipose tissue stem cells. Cell Biochem Funct.doi:10.1002/cbf.3158. Hu, W. et al. (2015). Mechanistic investigation of bone marrow suppression associated with palbociclib and its differentiation from cytotoxic chemotherapies. Clin Cancer Res. doi:10.1158/1078-0432.CCR-15-1421. Chang, Z. et al. (2015). Ascorbic acid provides protection for human chondrocytes against oxidative stress. Mol Med Rep. doi:10.3892/mmr.2015.4231. Hirano, T. et al. (2015). A novel interaction between FLICE-associated huge protein (FLASH) and E2A regulates cell proliferation and cellular senescence via tumor necrosis factor (TNF)-alpha-p21WAF1/CIP1 axis. PLoS One. 10:e0133205. Liao, C. K. et al. (2015). Depletion of B cell CLL/lymphoma 11B gene expression represses glioma cell growth. Mol Neurobiol. doi:10.1007/s12035-015-9231-1. Shimizu, R. et al. (2015). Cholangiocyte senescence caused by lysophosphatidylcholine as a potential implication in carcinogenesis. J Hepatobiliary Pancreat Sci.doi: 10.1002/jhbp.256. Klinkhammer, B. M. et al. (2014). Mesenchymal stem cells from rats with chronic kidney disease exhibit premature senescence and loss of regenerative potential. PLoS One. 9:e92115-e92115. Qi, H. et al. (2014). COH-203, a novel microtubule inhibitor, exhibits potent anti-tumor activity via p53-dependent senescence in hepatocellular carcinoma. Biochem Biophys Res Commun. 455:262-268. Lu, J. et al. (2014). SIRT1 counteracted the activation of STAT3 and NF-κB to repress the gastric cancer growth. Int J Clin Exp Med. 7:5050-5058. Malhotra, D. et al. (2010). Global Mapping of Binding Sites for Nrf2 Identifies Novel Targets in Cell Survival Response through ChIP-Seq Profiling and Network Analysis. Nucleic Acids Res. 10.1093/nar/gkq212 (#CBA-231).